← Special delivery for Mr. and Mrs. Burnell! Interesting that the houses were’t faced, like they are today. No, not the infamous and somewhat notorious housing estate in Tipton, but Brownhills. These photos are postcards currently for sale on everyone’s favourite tat bazaar, eBay, interestingly, all the way from a seller in Australia. Both cards are used, and date from the mid-1920’s. They unquestionably picture the Avenues Estate in Brownhills, I’d tenure not long after construction. What’s interesting to me is that both cards describe the location as ‘Garden City, Brownhills’. The same photographer clearly took both pictures at the same time, whilst stood on the corner of Lichfield Road and Chase (Ogley) Road, Brownhills, otherwise known as Co-op corner – it’s clear he just rotated 45 degrees. 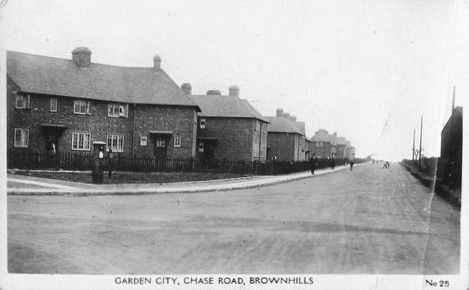 This estate – together with the Hussey Estate, would have been the beginning of the social housing boom, and probably the first steps Brownhills took as a town towards decent, affordable housing for it’s growing population. I’d be interested if any readers have heard the term ‘Garden City’ used to refer to the Avenues estate before – I certainly haven’t. Was it a general term for such new build at the time, or was this peculiar to Brownhills? Was the name official, and why did it die? As usial, please comment here, or BrownhillsBob at Googlemail dot com. Cheers. 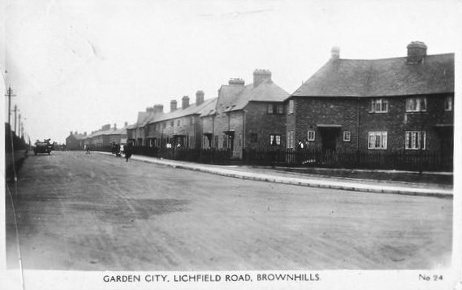 This entry was posted in Brownhills stuff, Environment, Interesting photos, Local History, Local media, News, planning, Shared media, Shared memories, Spotted whilst browsing the web, Walsall community and tagged 1920's, 20s, Austrailia, Avenues, Brownhills, Brownhills local history, Chase Road, estate, First Avenue, Garden City, Lichfield Road, Local History, New Photos, Ogley Road, planning, Postcard, Redevelopment, Second Avenue, Staffordshire, Third Avenue. Bookmark the permalink. Maybe just a term used in general for “the Garden City movement” of around 1900, by an Ebenezer Howard? Might not be, but it rings a bell with something I read a while back (in, I think, The Making of Modern Britain by Andrew Marr. The concept was adopted again in England after World War II, when the New Towns Act caused the development of many new communities based on Howard’s egalitarian ideas. There’s also the concept of Garden Suburbs (in the same article). Dad used to refer to that area as “the city” and my sister tells me uncle Bill Taylor (the bricklayer) called it “the garden city” – he would have remebered it being built and may even have worked there. Stymaster is right. Ebenezer Howard is regarded as one of the grandfather figures of town planning in England. He founded the Garden Cities Association, now the Town & Country Planning Association. This was part of a general movement in the 1890s towards better living conditions for the working classes, many of whom were living in squalid, over-crowded conditions affected by cholera and other pestilences. Obviously, some inspiration came from earlier experiments in town planning, such as Port Sunlight, Saltaire and Bournville. The 1890 Housing Act made local authorities responsible for providing decent housing and schemes like The Avenues followed (though this project was much later – 1920s?). As I recall it, the green belt had different origins, though with similar intent, concerned with people having access to fresh air, open space and healthy exercise. One of the pioneers was Octavia Hill, who purchased land in the Surrey Hills (including part of Box Hill, which featured in the Olympic cycling) and arranged outings for some of her tenants. She was a pioneer of housing associations and founder of the National Trust. Hi Bob. I really enjoy reading your blog. I was born in the Avenues in 1956 as we’re my brothers. We were reared in the Avenues and had a very happy childhood. My mum came to live here in 1954 until her death in June of this year at the age of 84. My mum said it was called the Garden City because in the early days the gardens were immaculate! I never heard the name Garden City used, so presumably the name had passed from common use by 1950 at the latest. It was sometimes referred to as The Avenues. Often it was referred to as The Buildings, pronounced “the bildins”. If someone from “the bildins” was going to the Brownhills High Street area to shop, they would simply say that they were going “down Brownhills”. This seemed strange to me as it was actually slightly uphill, and I thought I was already in Brownhills. Much later I found out that The Avenues were actually in the old parish of Ogley Hay, and that Brownhills was a 19th century development. The two photos do not quite join together, neither of them show the passageway through the middle of the row of houses in the foreground, leading to the Avenues. I well remember waiting each morning at the Co-op corner bus stop, for the number 5 bus to take me to school in Walsall. In misty late autumn you could break a twig off the hedge, bend it in a loop and collect up a spiders web glistening with moisture. On freezing winter mornings you just stood there hoping that the bus would be on time, glad that the sleeves of the pullover which mom had knitted “so that you can grow into it” reached beyond the end of my fingers. Eventually Walsall Corporation bought new buses with luxuries like heaters, and doors instead of open platforms. Bliss! Hi great info on the avenues I first lived at 23 fourth avenue, then we moved to no_7silver street where mount Zion is now,from there to no7 first avenue. But you didt say you were from the buildings back then was through that you were rough people that lived there. But we had plenty fun as kids. growing up there. Still have relative’s living in the avenues. Plenty good memory’s. If anyone is interested about people in packams puzzle i.e the avenues they can get information from find my past 1939 cencus which was taken during 24 hours at the start of the second world war it lists people who are deceased since but gives a complete list of all the houses of any town in england i also know a lot of peples names who live in those houses on co-op corner also have old information about maria fitzgeralds photo old blog i.e. photo of old folks and first aid certificate thank you brian ashford. The view down Lichfield Road shows the impressively wide dead straight roadway that ends in an odd kink to a narrower older section just before the School Avenue/Barnetts Lane junction.